These Front Leaf Spring and Shackle Bushings from Energy Suspension will restore or upgrade the front suspension of the Jeep CJ5, CJ7, and CJ8 Scrambler. 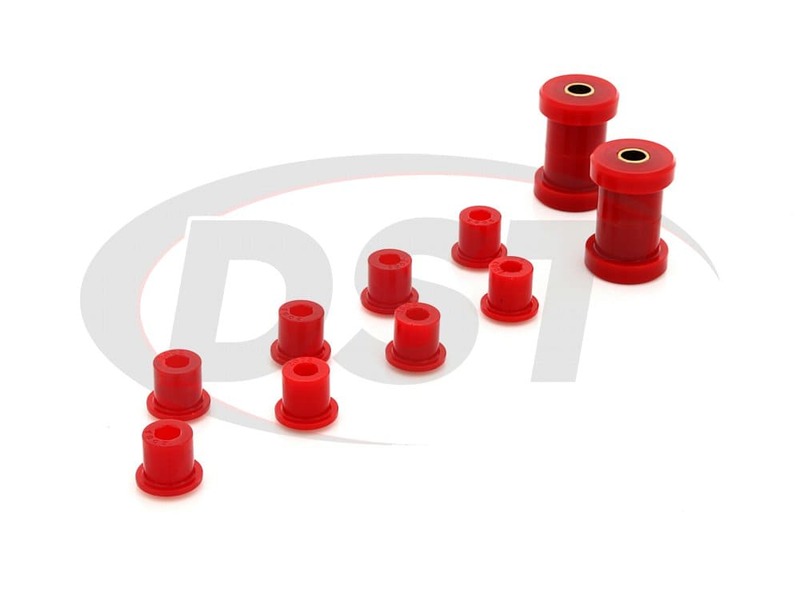 Worn original leaf spring bushings can cause clunks or clanks when taking off or braking and even be responsible for steering or death wobble, but these polyurethane bushings will eliminate that noise and correct axle and wheel alignment in your Jeep. The front leaf springs cushion the bumps between your wheels and the frame of your Jeep. 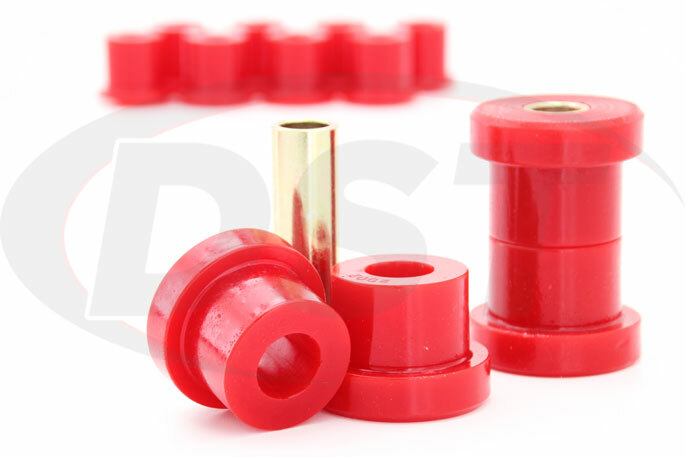 The original soft rubber bushings absorb that vibration very well, but the problem is that the rubber bends and flexes until, over time, the shape of the bushing changes and it is permanently deformed. With a loose bushing holding the front leaf spring, which keeps the axle in alignment, can shift especially when accelerating or braking. This can change the alignment of your front axle and wheels which can cause steering and handling issues as you might imagine. 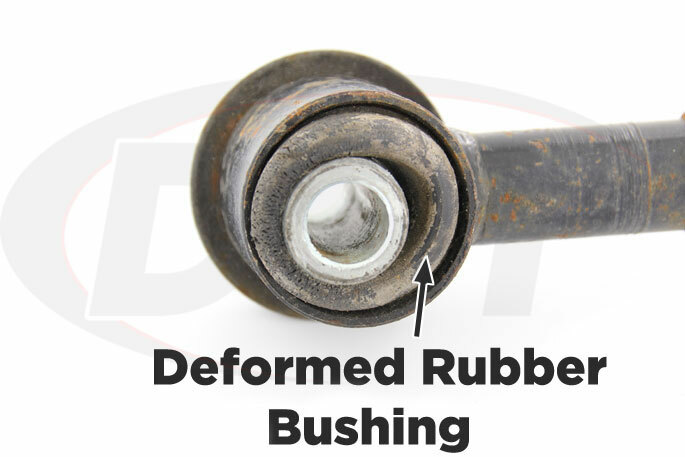 You could replace the original bushings with more rubber to restore your ride, but if you enjoy wheeling your Jeep around central Texas pastures every weekend then you should probably look for more durable bushings. 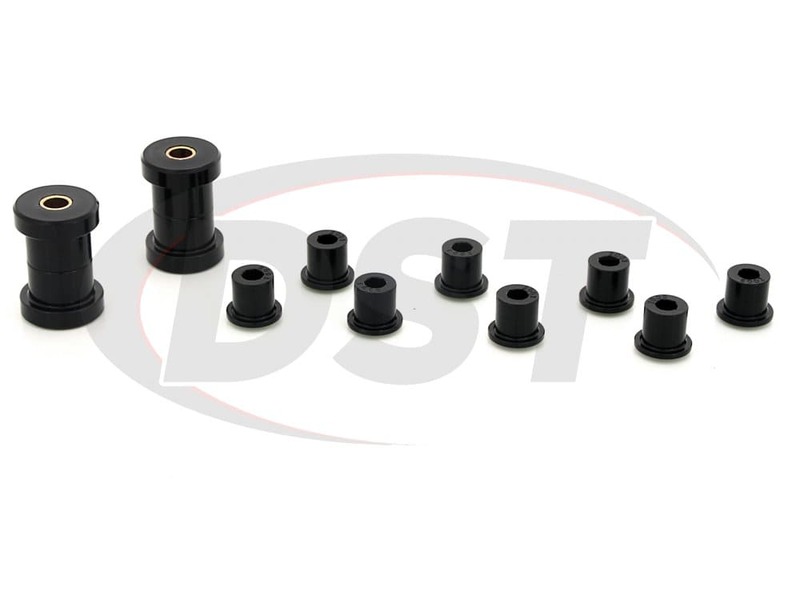 Energy Suspension's Front Leaf Spring Bushings for these Jeep's are much more resistant to wear than the original rubber and will last much, much longer. 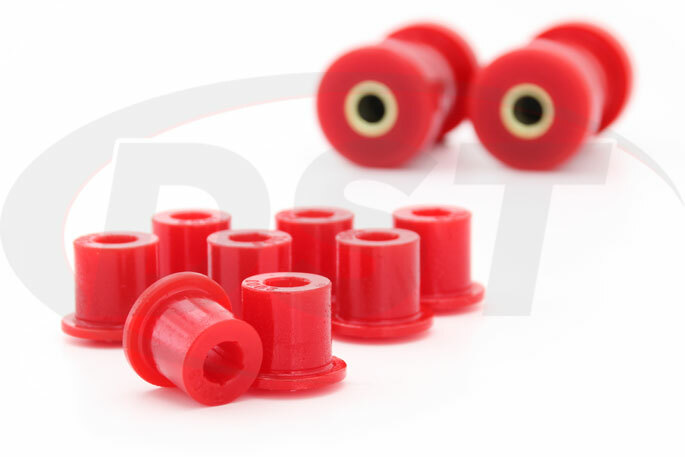 These polyurethane bushings are tough enough to take the punishment that off-roading can inflict on your suspension and still provide a comfortable ride on the highway. 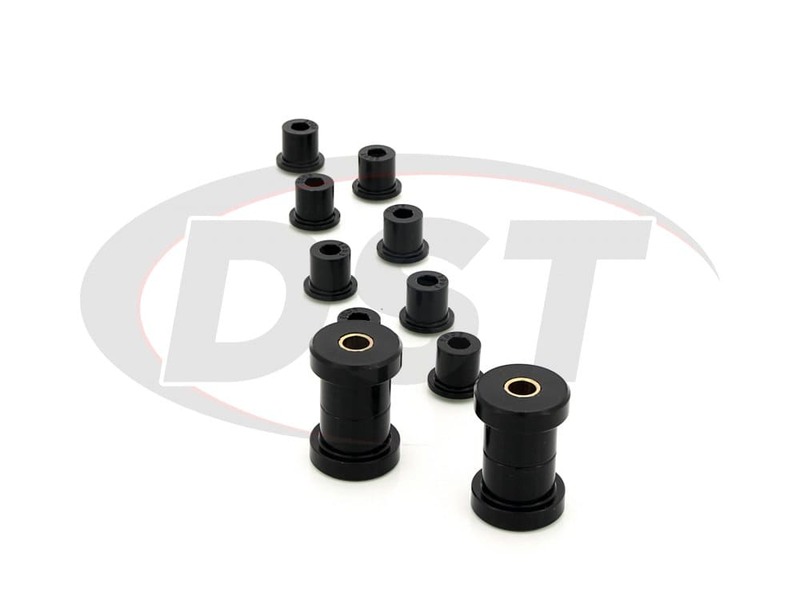 You won't have to worry about axle alignment since these bushings do not flex and bend like rubber and will resist shape change leaving you with a secure leaf spring to frame connection. 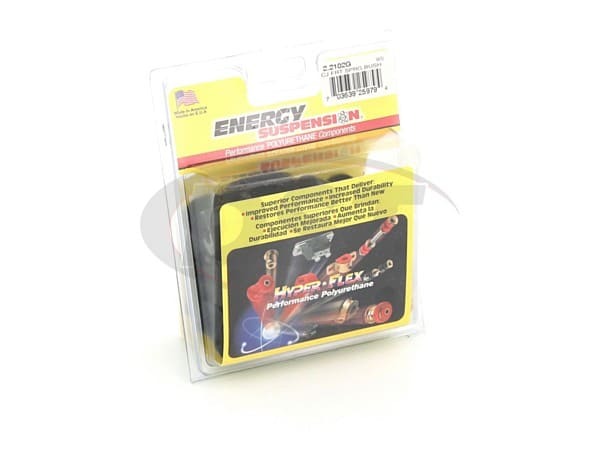 This can reduce steering wander caused by worn leaf spring and shackle bushings and even translates into more even tire wear and less frequent replacements caused by scrubbing along the front tire's edge. 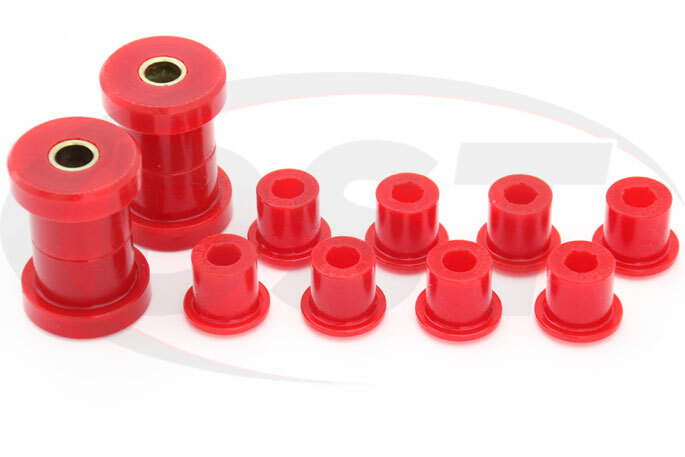 The bushings in this kit are firmer than the originals, but they balance performance and comfort much better than rubber. 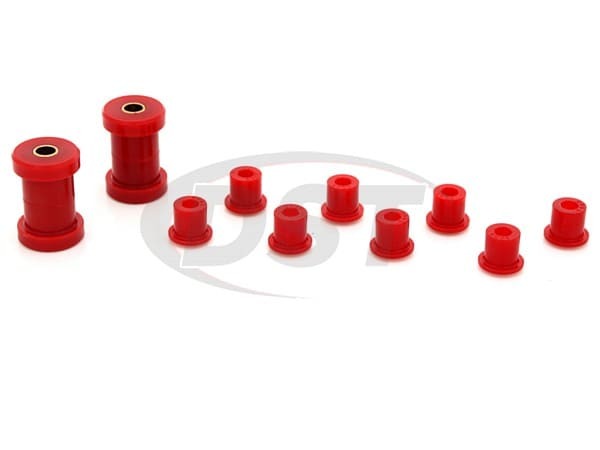 If you find yourself having to take your Jeep in for front end alignment more frequently then these polyurethane bushings are probably a good fit for you. Whether you're looking to restore an old CJ5 or upgrade your weekend rock crawler these front leaf spring and shackle bushings will tighten up looseness in the leaf springs. This kit is also covered by Suspension.com's exclusive lifetime warranty, so we believe it has the potential to outlast your Jeep. If you are afraid these 95A durometer bushings will make your ride too rough, or you have aftermarket shackles, then Energy Suspension also offers 88A durometer front leaf spring bushings for these Jeep year models as an option that reduces noise and vibration, but is still much more durable than rubber. Thank you for everything the parts are awesome and look great .